I just read a statistic that says that 2 out of 3 households in the US have at least one pet. In 2014, and just in the US, it’s estimated that people will spend $58 BILLION dollars on pets. Most of it will go to food and other supplies. So, this is a huge industry where a lot of money is being spent – and where a lot of money is being MADE. The reason I’m creating this post is to let you know that my good friend Coolice has come up with something called Pet Store Clone. So, what is Pet Store Clone? Your visitors can go directly to the type of pets and supplies they want, with the click of a button. They can search by pet. They can search by type of pet item. They can search for items that have a specific amount of review stars. They can search by price. They can also search by brand. A little side-note: my 1-Click Video Ranker WordPress plugin is now compatible with clone sites like this. When I first launched the plugin, it couldn’t find the video and add it to the video sitemap, but the new version, that is already available, does this. /end side-note. Anyway, if the visitor clicks the “Buy on Amazon” button, they will be taken to Amazon to buy the product. Amazon is a big and trusted name, and people don’t hesitate to buy from there. And of course, you can use more plugins on the site, to extend it’s functionality. Including plugins by yours truly. Btw, Pet Store Clone also has some extra text content to educate your visitors. 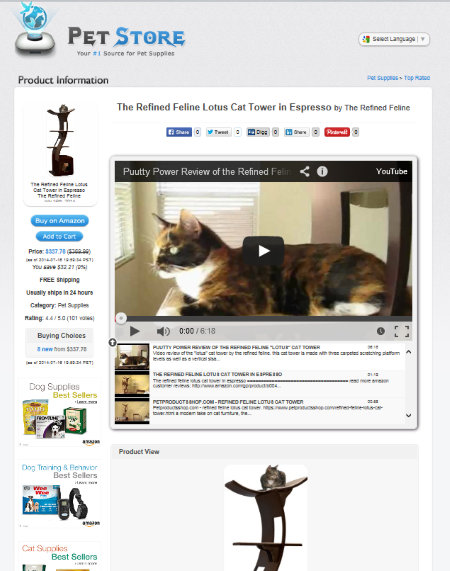 The regular single-site version of Pet Store Clone comes with 1,565 posts (products) in 15 categories and with 11 brands. But for the demo site I set up, I used the unlimited, multi-site license which has more than 10 times the content. The unlimited license has 15,801 posts/products in 97 categories and with 230 of the most popular brands in the pet niche. Also, If you are thinking of buying this business in a box, use the link on this page. Why? Because I will also send you an extra bonus of your choice. You can use it to make your Pet Store Clone site even more successful. STEP 1: Go to Pet Store Clone and purchase the package. Note: The price of the regular version will go up from $37 to $67 on August 4th, 11:00 AM, EST. Btw, there are some bonuses that Coolice has made available to affiliates. These bonuses will help you promote your store and get traffic to it. Many affiliates will promise these bonuses to you, if you buy Pet Store Clone through their affiliate link. 1) Pet Clone isn’t just a WordPress “theme” or “plugin” – it’s an already-made WordPress Amazon site. You get to upload a zip file on your hosting account, and then you set up your site following an easy “wizard” interface. 2) This is a ready-made store that sells pet products. It cannot be customized to promote products in other niches. 3) “Unlimited” and “multi-site” isn’t related to “WordPress multisite.” It just means that you can install Beauty Clone on unlimited domains you own. 4) You need to have your own domain and hosting account. A domain will cost about $10/year. I use Namecheap.com. Hosting is $5-$10 per month (for probably unlimited sites). I use Hostgator.com. Coolice has a list of 100 domains that will work great in the “pet” niche, and, if you are quick, you can register one (or more) of them. That domain list basically gives you domain ideas. 10) Several guides are included with your purchase that show you how to promote your Pet Clone website.